does more than absorb a considerable amount of our excess CO2 – it also soaks up nearly all of the additional warmth resulting from the manmade greenhouse effect. 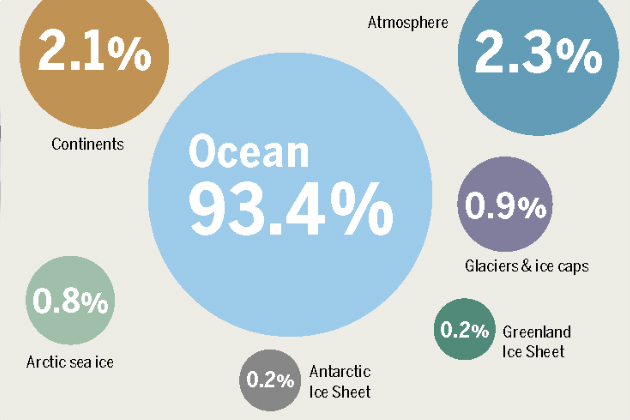 Over the last 40 years it has absorbed an astounding 93 percent of the excess heat – increased atmospheric temperatures are attributable to just three percent of this additional thermal energy and would be much greater if not for the ocean. The extra warmth is essentially hidden in the ocean, where it slowly spreads through the depths. Because of this, the surface temperature only increases at a snail’s pace. But all this has a price. Absorbing excess CO2 leads to the progressive acidification of the ocean, while absorbing excess heat contributes to the rising sea level and troubling changes in marine ecosystems. And the warming of the oceans contains another risk: positive feedback loops. For example: when the rate of evaporation on the ocean surface increases, it produces more water vapor, which causes temperatures to rise, which causes the rate of evaporation to increase. That’s because water vapor is a greenhouse gas like CO2 – in fact, it is even more effective than CO2. 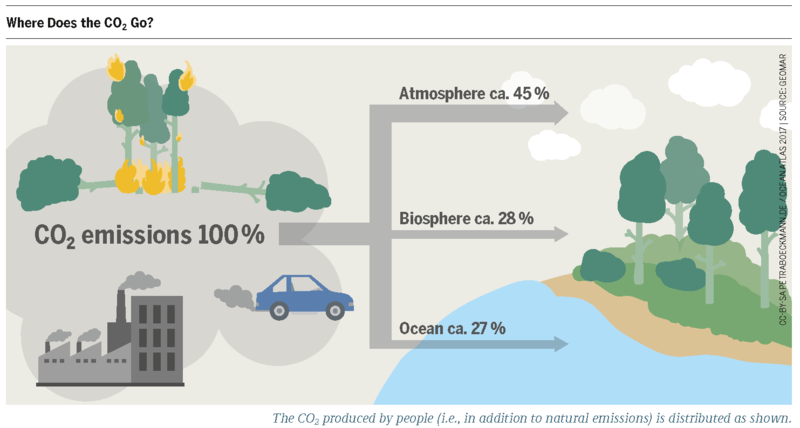 In itself, that’s not a bad thing: around two-thirds of the natural greenhouse effect, which has made the Earth inhabitable for millions of years, is caused by water vapor; only a quarter of it is caused by CO2. But if we release too much CO2 into the atmosphere, the feedback loop described above greatly amplifies its effects. 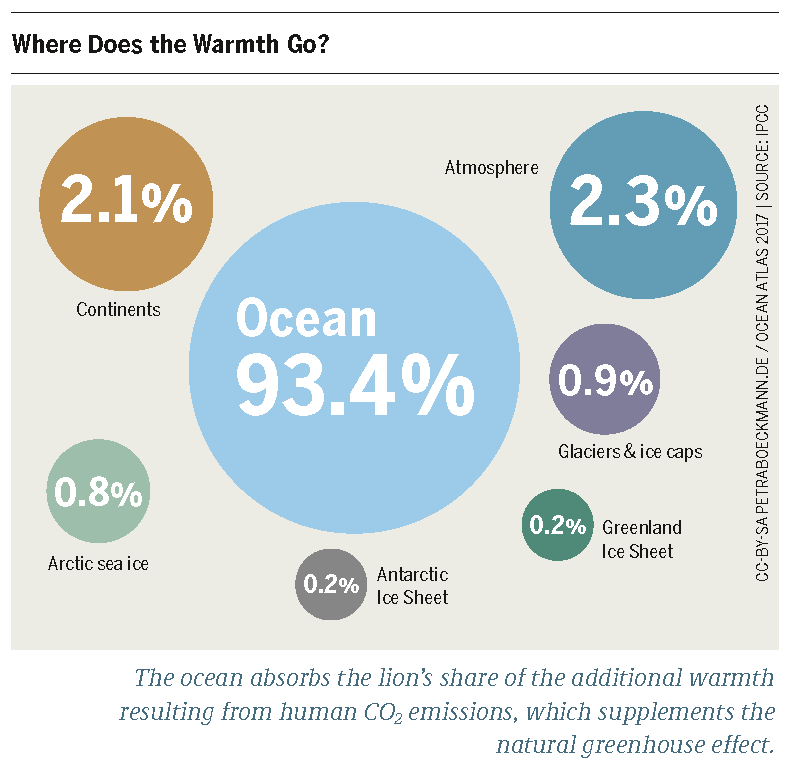 Infographic from the Ocean Atlas – Where Does the Warmth Go? 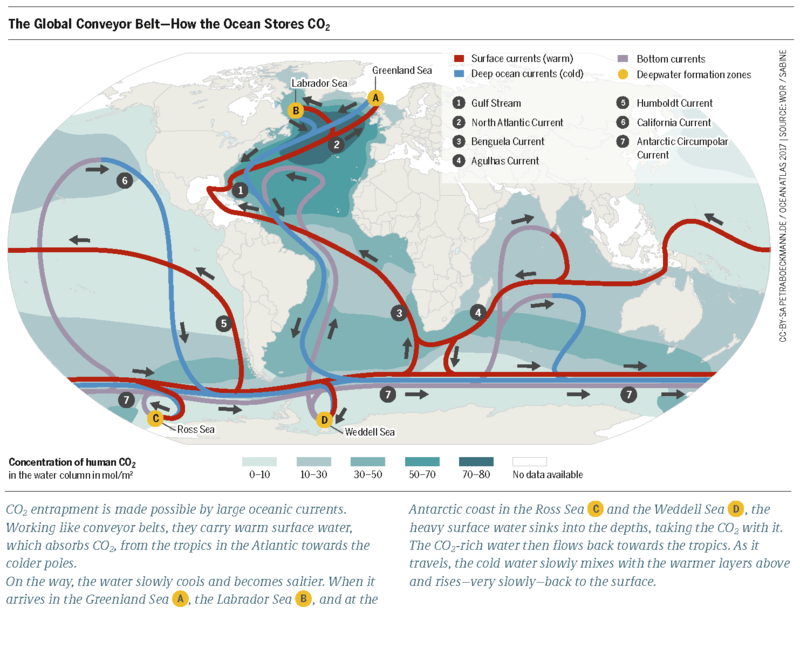 Infographic from the Ocean Atlas – Where Does the CO2 Go?